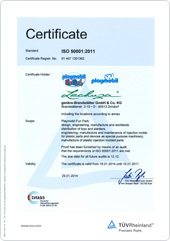 We, the company geobra Brandstätter Stiftung & Co. KG, manufacture PLAYMOBIL and are Germany’s largest toy manufacturer. Children from ages 1 ½ to approx. 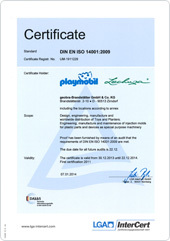 12 years play with our products. Children are our future. For this reason we have a special obligation to responsibly manage the resources needed for our production processes and to consider our impact on the environment. Of course, this obligation includes our production of LECHUZA planters. It is our commitment and minimum standard to self evidently comply with legal obligations and further requirements. Where possible it is our aim to exceed these. Continual improvement of our production’s environmental impact based on concrete objectives in order to protect our natural resources and to avoid pollution. This also includes a long term reduction of our energy consumption and enhancement of our energy efficiency. We consider energy efficiency in our purchase processes of new facilities, products and services, which are destined to improve our energy related performance. We train our employees to make them aware of how their work impacts on the environment and to use energy in a responsible way. We involve our suppliers and sub-contractors in our Environmental Management System so that they can also conserve the required resources and take advantage of potentials for conservation and reusability. Managers and employees of our company are committed to this Environmental and Energy Policy. The management and all employees actively take part in applying the principles of our Environmental and Energy Management System and following our aim to continuously improve environmental performance and energy efficiency. We work together to implement this so that children may continue to grow up and play in a healthy and liveable environment.